When me and my sister were kids we had a few videos we watched almost everyday, a compilation of Thundecats episodes was one of them, we also got the original Thundertank for Christmas one year. The show was one of the best animated cartoons in the 80`s, the quality of the animation was far greater than other shows of the same time. 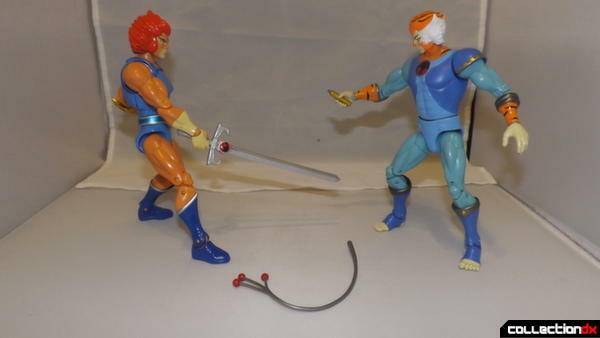 So being a geek and a toy collector i couldn't resist when Bandai America brought out their 8 inch Classic Thundercats figures. 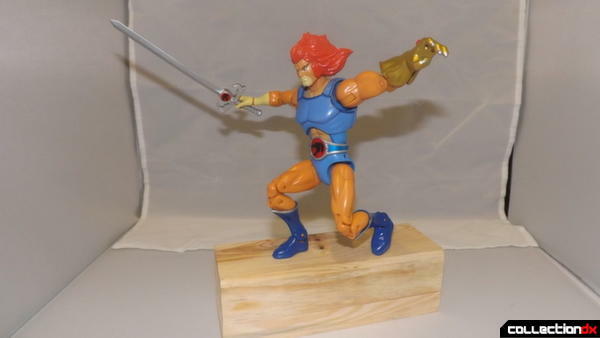 First for release was Lion-O, this is the retail version not the SDCC version with the chromed sword and stand. 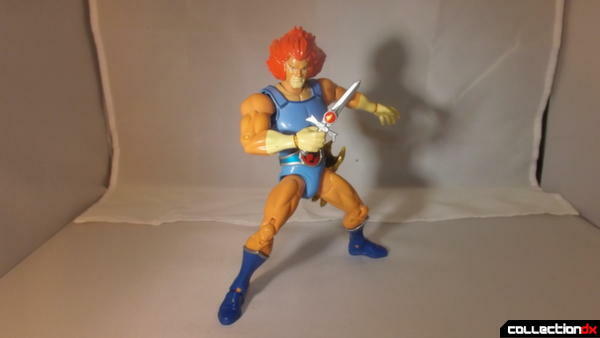 Apart from a few odd design choices Lion-O is a great figure, he has a good likeness to the 80's character and 18 points of articulation. One of those odd design choices is the detailing on his bum cheeks, which you can see for yourself. The face has some nice detail, it feels like it wasn't rushed when applying the black lines. 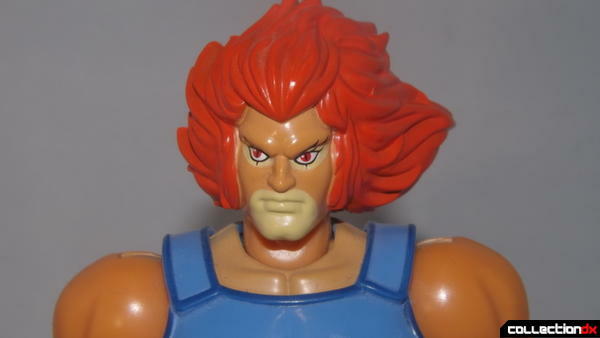 The hair line has a slight issue with the red not filling the gaps as it connects to the face. The hair itself is molded to flow out to the left of the figure. 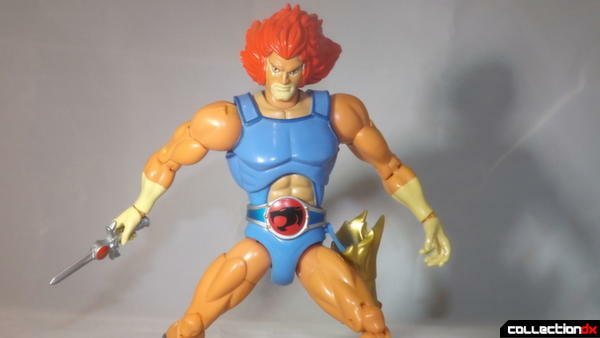 Lion-O's outfit is faithful to the cartoon, even with the odd opening for the belly and massive belt. 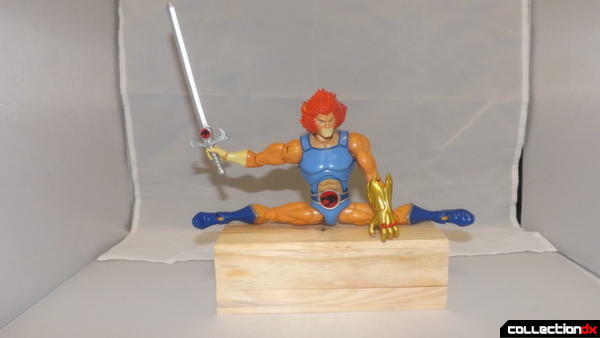 The crotch area has the infamous thundercats flatness (see the pilot episode). 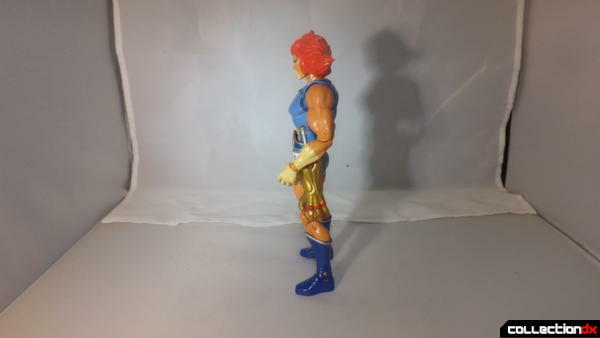 There's some great articulation on this figure, as i mentioned earlier it has 18 points, the head is on a ball joint at the top of the neck and a swivel at the bottom. 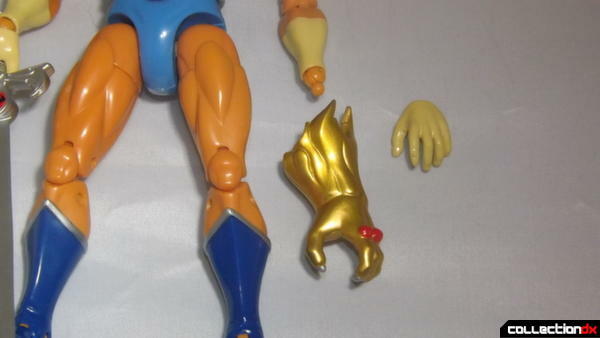 Both arms have a ball joint at the shoulder, bicep swivel, single elbow joint, and a wrist ball joint. The torso has a diaphragm joint which allows for movement up, down and sideways. The legs have a ball at the hip, swivel for the upper thigh, double jointed knees, and a swivel at the top of the boots. Finally the feel have a swivel forward and back and a decent side to side joint. 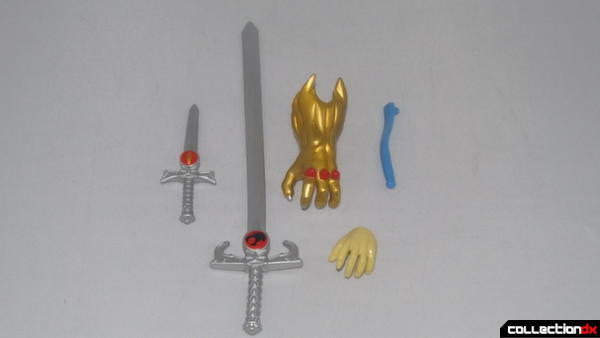 Accessories are two versions of the Sword of Omens, the small "closed eye" hilt version and the larger battle version. Both are made from rubber but the larger one has a tendency to bend, flex and warp, mine has a slight lean to one side. 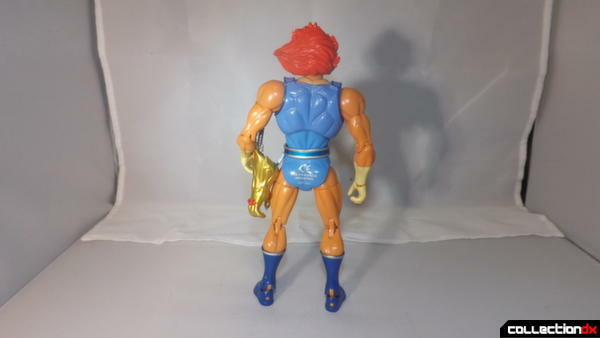 Also included is a left hand and the Claw Shield which i'll go into in a moment, finally there is an extra blue piece that attaches to Lion-O's hip that allows the Claw Shield to be stored. 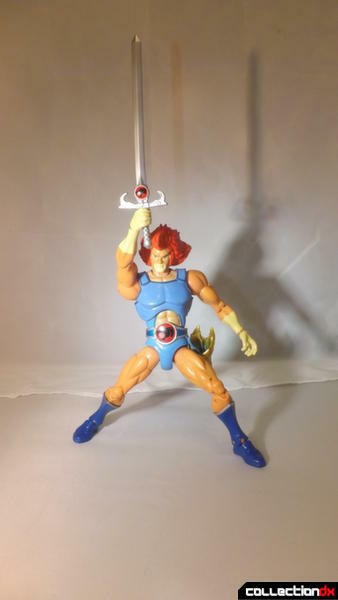 First up the Sword of Omens, the small version fits a little loosely in Lion-O's hand (right only) but you can still get some poses from. 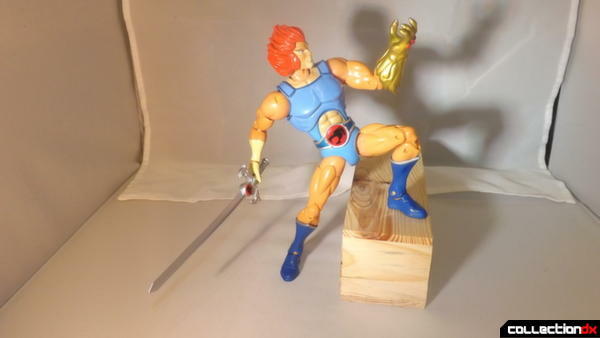 The small version also fits into the Claw Shield for storage with a nice molded hole to fit into, you can even have the sword in the Gauntlet when Lion-O is wearing it. 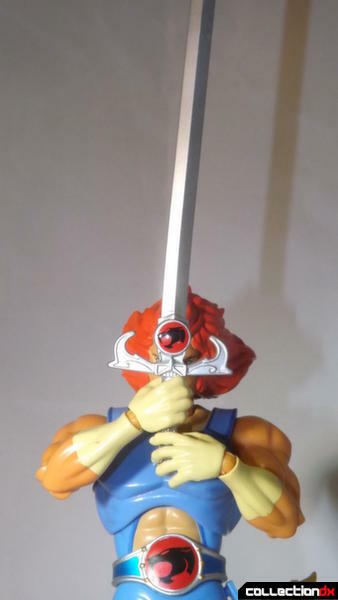 "Eye of Thundara, give me sight beyond sight"
The full sized sword has a better fit in Lion-O's right hand, it has the opened "Eye" showing the Thundercats Logo. The left hand and Claw Shield are inter-changable, it's a choice between one or the other. 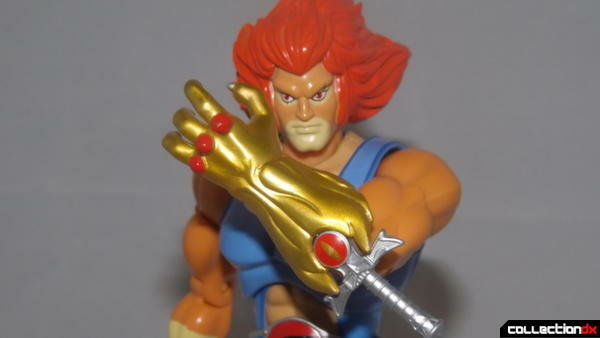 It's a shame they couldn't figure out a way of slipping the claw over the hand, but i see why they did it because it gives a better look for the claw. 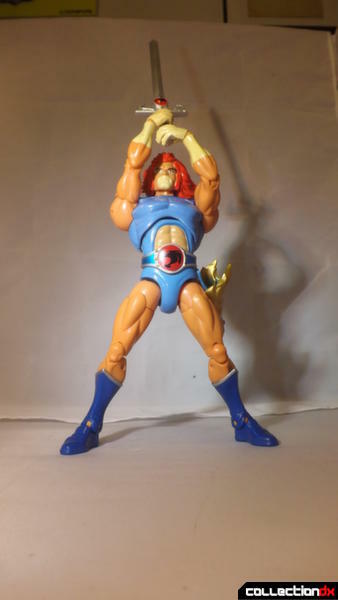 Simply pull the left hand from the ball joint and replace with the Claw Shield. 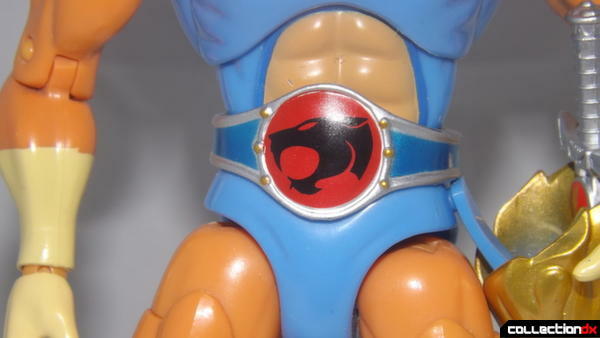 The same method is used for the extra blue piece to attach the Claw Shield to his hip. Here are some random poses to show the flexibility of the figure. On to the other design issue with this figure, the joints. For some unknown reason the designers thought it was better to have skin coloured joints for the feet, breaking up the blue of his boots. I have no idea why this was done other than cheapness. The original show was animated in Japan while being produced, written and voice-acted in the United States. Many of the artists went on to be in Studio Ghibli, and worked on Hayao Miyazaki's first film. 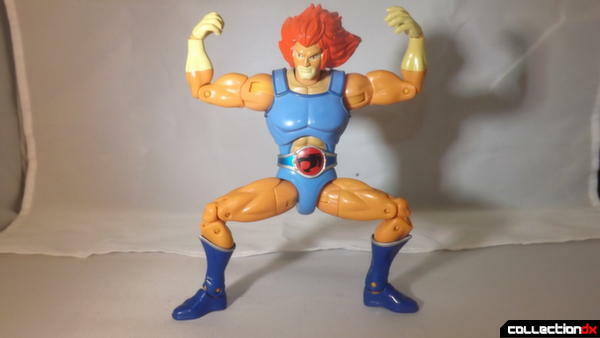 So i do recommend both Lion-O and Tygra to fans of the Thundercats, even with their odd design choices. 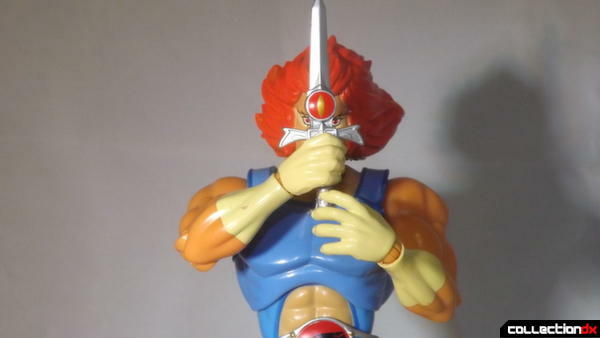 It looks like we probably won't be getting any more in this 8 inch line, unless Bandai suddenly have a change of heart. 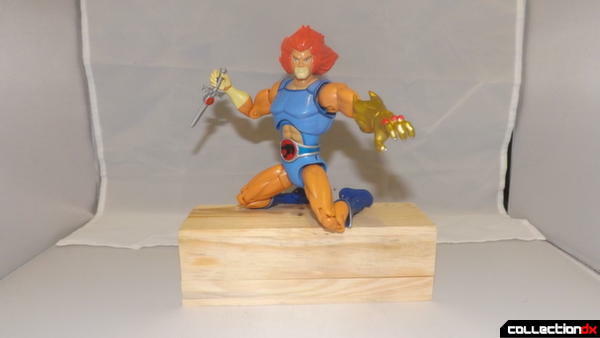 I would have liked to complete the collection, at least with the rest of the Thundercat team and maybe Mumm-Ra. Great review as always, I really enjoyed this line as well and hoped we could've seen a few more additions. 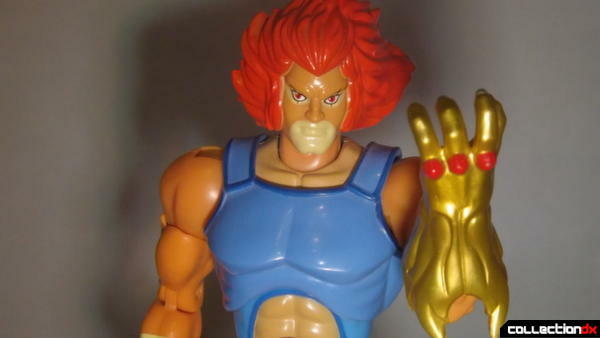 Was a shame the new show didnt have a chance to see a 2nd season or we might've had more classic figures. Im told the low number sales of the toy line from the new show was what canned the series, I really wish the success or failure of a toy line wouldn't have to be the life line of a good show. In any case, I Sincerely hope Bandai revisits this line someday and decides to complete the set. 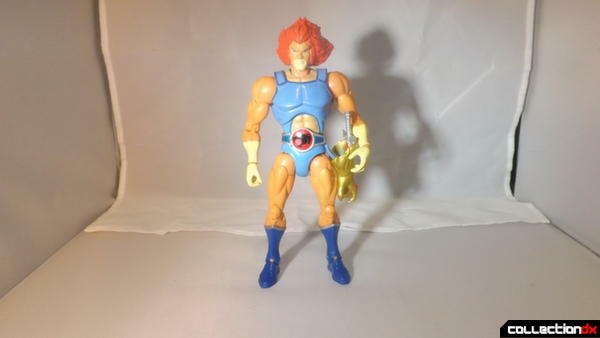 I got the Lion-O but passed on the Tigra because I was waiting for a Panthro to be made. The new show was great and I was eagerly anticipating a second season as well. Oh well, at least I still have my fond memories of the original show to hold on to! 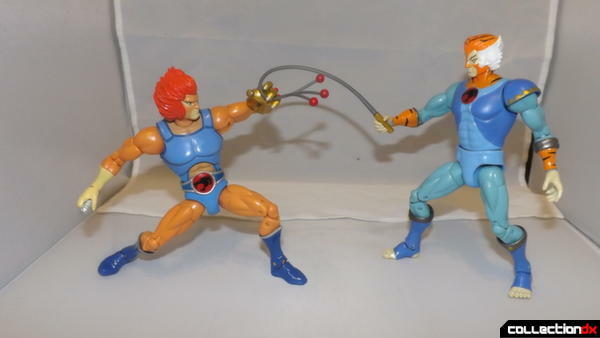 I think Mattel was crushing the MOTU classics line and at it's peak when these figures came out. Unfortunately Bandai really phoned in these figures. Glossy finish, flesh colored joints, questionable abb crunch, uneven paint apps when you compare these to what Mattel and the 4 Horsemen her sending out they come up wanting. 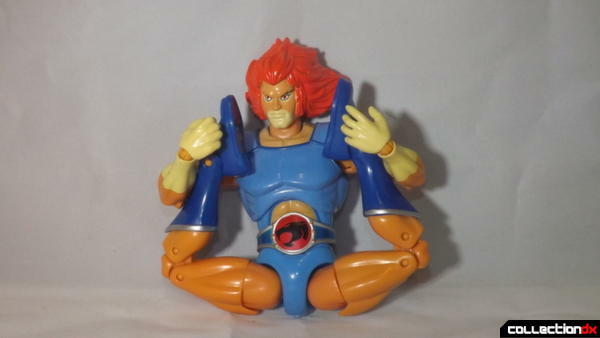 Thundercats deserves better. Great review. 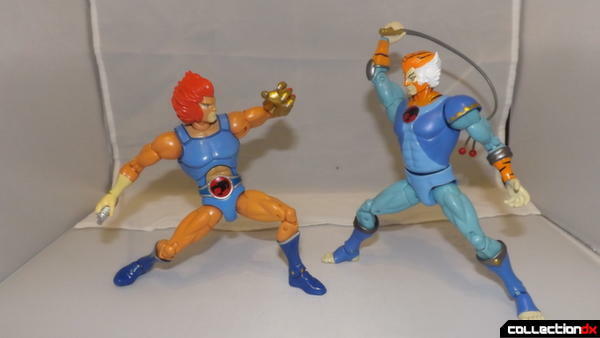 The 8" Classics could have been a great line if a little more effort had been put into them and the other main characters released. 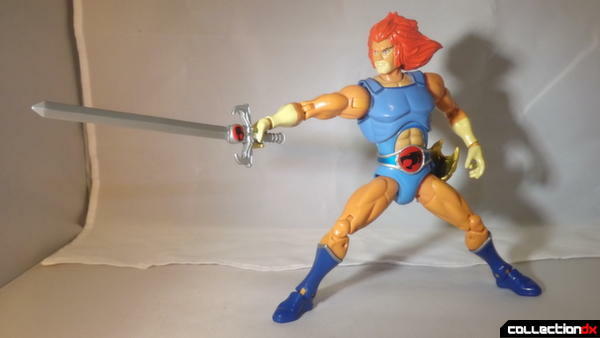 Still even with its faults it's great having a big Lion-O that is so articulated with all his accessories from the show. As bad as the toys for the 2011 series were they cannot be blamed entirely for the failure of the 2011 show as it had a lot of faults on its own that turned viewers away. I personally did not like the new series and I did not like their plans for the second season. 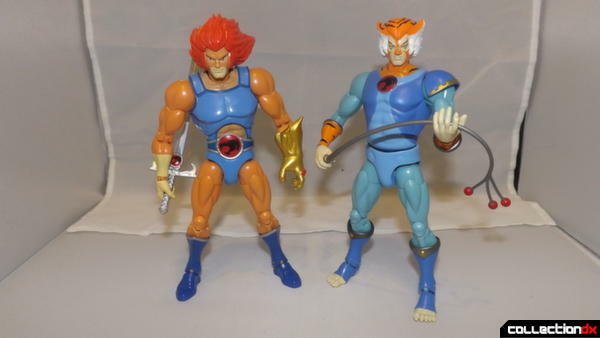 I hope one day Diamond Select, NECA, Playmates or Mattel make some figures based on the original series.